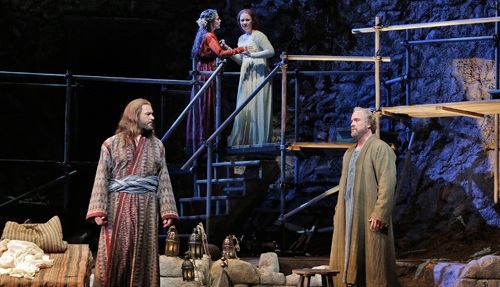 This past Sunday, I had the good fortune to be invited by the San Francisco Opera to live tweet the final dress rehearsal of Mark Adamo’s The Gospel of Mary Magdalene, which had its world premiere last night at the War Memorial Opera House. I remembered being very impressed by Adamo’s Little Women ten years earlier in New York (in fact, it was my introduction to contemporary opera), so I was looking forward to see what he would do with such a controversial subject. It was an interesting experience to say the least. My fellow tweeters were an entertaining group and we had fabulous box seats. It was difficult at times to both follow the opera and be tweeting and reading the Twitter feed, but I thoroughly enjoyed myself. What follows are some of my random musings during the performance. Make of them what you will. 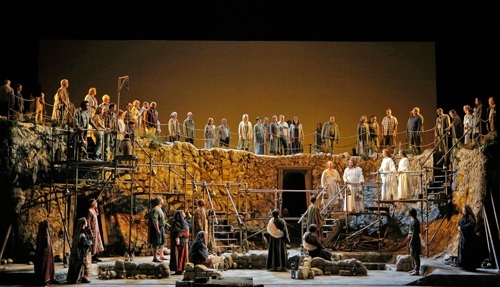 Adamo based this opera on both the Canonical and Gnostic Gospels. I was happy to have a thorough knowledge of both (thanks to Congregationalist Sunday School, a Jesuit university, and the work of scholars such as Bart Ehrman and Elaine Pagels) because otherwise I think I would have been as confused as some of the self-proclaimed “heathens” in my box. As the opera begins, we see modern Christians (in what looks to be an archaeological dig in the Holy Land) lamenting the sexism that tarnishes their religious tradition. The chorus arrives to reveal and complete the “real” story with the discovery of the Nag Hammadi library, and introduces the Magdalene (Sasha Cooke) as a character out of the Song of Songs. 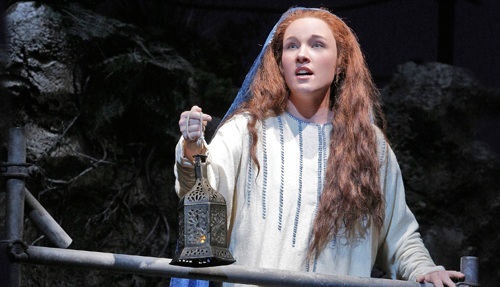 Sasha Cooke as Mary Magdalene. Photo by Cory Weaver. Very quickly we move into biblical times and experience the clash of Old Testament teachings via Tamar, the wife of Mary’s lover who wants her stoned. I couldn’t help but think of Monty Python’s Life of Brian. Luckily, Jesus (here called Yeshua, and played by Nathan Gunn), arrives just in time to save the day. One thing I really enjoyed about this opera was the humor in Act One. —How miserable is the body that depends on the body. It’s Yeshua, yes?… Your brother’s James? Your father… Right. That we won’t discuss. This humor is perhaps why many of our tweets quickly grew quite irreverent. While initially it is Miriam (Maria Kanyova), Yeshua’s guilt-ridden mother, who first warns Mary away from her son, it is Peter (William Burden) who turns out to be the villain of this particular passion play. Yeshua (Nathan Gunn) and Peter (William Burden) argue as Mary (Sasha Cooke) and Miriam (Maria Kanyova) look on. Photo by Cory Weaver. Peter tries to keep Mary from Yeshua and constantly rails against women, leading me to suspect he is either a closeted Republican or gamer (“Females are not worthy of this life.”). Yeshua almost falls for his line, but the end of Act One sees the wedding of Yeshua and Mary, much to Peter’s dismay. Yeshua and Mary Magdalene marry. Photo by Cory Weaver. Even in our box of irreverent tweeters, you could tell people were somewhat discomfited by the sight of Jesus in bed with someone. Yet everyone sounded so beautiful, it was hard not to be captivated by the love story. 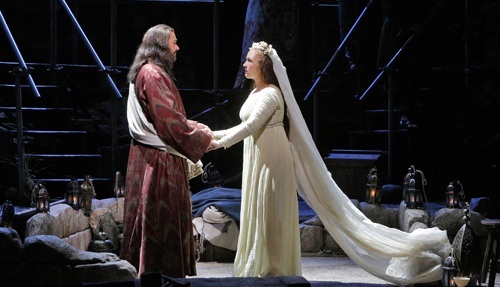 I was particularly impressed by mezzo-soprano Sasha Cooke’s gorgeous tone. She sounded positively angelic. While the principals sang well, I wasn’t particularly struck by the opera’s music, although I felt the libretto offered a number of thought-provoking pieces and interpretations of this story. Repetition was used quite a bit, which mostly worked well. However, more than one tweeter noted that perhaps variations of “seven times seven” and “seventy times seven” came up too often. 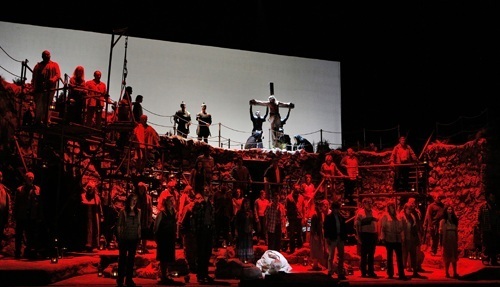 Of course, this opera was never going to end well, and Act Two begins with the inevitable politicization of Yeshua’s movement and the road to crucifixion. Despite, or maybe because of, his own guilt for denying Yeshua, Peter’s anger towards Mary continues unabated, and even Miriam, who was the first to try to keep them apart, chastises Peter. Overall, I liked the set, but was disappointed it remained the same for both acts. Additionally, its size and the way it was constructed prevented the production from being as dynamic as one might expect from the story being told. However, I loved the staging for the final scenes at the tomb, which, except for the oddity of Jesus descending to exit, were extremely moving. I was very happy to have participated in this event and am eager to see how this opera is received now that it has had its premiere. While the story may be deemed controversial, I found it to be thoroughly researched and thoughtfully presented. *Yes, that’s one for each apostle plus Jesus and Mary. As I wrote last year at this time, I’m not Catholic, but the practice of giving up something for Lent is a holdover from my college days at a Catholic university. I generally use this time to become more mindful of good behaviors I might pursue and to break potentially bad cycles of behavior. In the past, giving up concrete items has proved easiest to stick to, while concepts based on self-improvement have been tough. So, this year, I’ve decided to go traditional and give up meat. And I don’t mean just on Fridays. There was a time when I was a vegetarian, but then I moved to France and that was the end of that (although my elderly aunt, or “la tante qui sait tout” as some might know her, made tremendous efforts at experimenting with tofu recipes for our weekly dinners). I still tried to at least keep a vegetarian kitchen, but that radically changed when I moved to San Francisco and 1) started to go to Sous Kitchen* and 2) got a slow cooker. Both of which meant I was suddenly cooking a lot more meat on a regular basis. Recipe suggestions (that don’t involve pasta) welcome! *Sous Kitchen is a service where they prepare and package high-end ingredients for you to freeze and then prepare “from scratch” at home—recipes include many exotic dishes I would never make otherwise, such as panang curry or kung pao chicken. One used to be able to assemble the recipes oneself on site, adjusting everything but the protein to one’s own taste. It was quite fun to do with friends, but unfortunately they only have a pick-up/delivery service now. I’m not Catholic. By all rights I should be, given my parents’ background, but they weren’t religious and gave up even baptizing their kids after the first one. Bizarrely, I did make my way to Congregationalist Sunday School on my own in third grade and continued to be a steady churchgoer through college and beyond, including weekly mass at my Catholic university (hey, all the kids were doing it). But the story of my finding and losing religion is one for another day. One thing that has stuck, however, is the practice of giving up something for Lent. I find that it is a great way for me to be more mindful of habits I’ve fallen into and to break potentially bad cycles of behavior. Generally, it has been pretty easy for me to decide what to give up; something just made sense, whether it was meat, processed foods, or alcohol (although most people just thought I was pregnant). This year, however, I struggled. There wasn’t an obvious food issue. Plus, I’m going on vacation with family soon and that could pose a lot of problems. Television? If I did that, I might have to revert to the “cheating” version of Lent that doesn’t count Sundays. * Something Internet-related? Getting to work on time (something that started slipping during the World Cup and has never really righted itself)? No one thing stood out. In the end, I realized that the change I most wanted to make was to get back to my stairway walks. Although I walk to work for 30 minutes every day, it’s over perhaps the least hilly terrain in San Francisco and not very challenging physically. So I decided to give up laziness, which would potentially address a number of smaller problems as well. While concepts have never worked very well for me (giving up gossip at work was an epic failure), perhaps this year will be different. I’ll get back to you in forty (or rather, forty-six) days. * Lent is forty days long to represent the time that, according to the Bible, Jesus spent in the desert denying Satan’s temptations. In Western Christianity, the Lenten period begins on Ash Wednesday and concludes on Holy Saturday. A quick check of the calendar reveals this to actually be 46 days. Sort of how people say pregnancy is nine months, but in reality it’s forty weeks—a technical, but big, difference, as I’m sure any woman who’s actually been pregnant can tell you. Let me start off by saying that I am not at all religious and these days pretty much regard Christmas as a secular holiday. However, when it comes to music, I like to keep the Christ in Christmas. So, when I say I love Christmas music, I generally don’t mean anything that uses the words rock or bells (although exceptions can be made in the case of music recorded before I was born). The fact that I have relegated all my Santa-related music to a playlist called “Get Behind Me, Santa” basically tells you all you need to know. Along with opera, Christmas music is really the only thing I buy on CD these days and I recently added a few new favorites to my collection that I wanted to share. 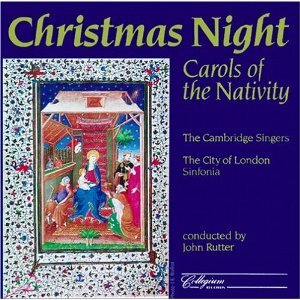 The first two albums are by The Cambridge Singers, conducted by John Rutter—Christmas Night: Carols of the Nativity and The Cambridge Singers Christmas Album. I can’t believe this group escaped my notice for so long. 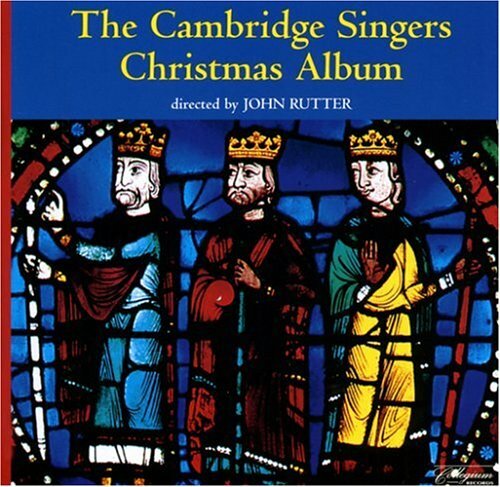 Both of these albums are fabulous collections of traditional European carols, and, although I’d give a slight edge to the selection on Christmas Album (“Somerset Wassail”; “Still, Still, Still”; “Gabriel’s Message”; “In dulci jubilo”), Christmas Night has “The Cherry Tree Carol,” which is one of my all-time favorites. Also out of England is a collection from the early 1990s, A Traditional Christmas Carol Collection by The Sixteen, conducted by Harry Christophers. 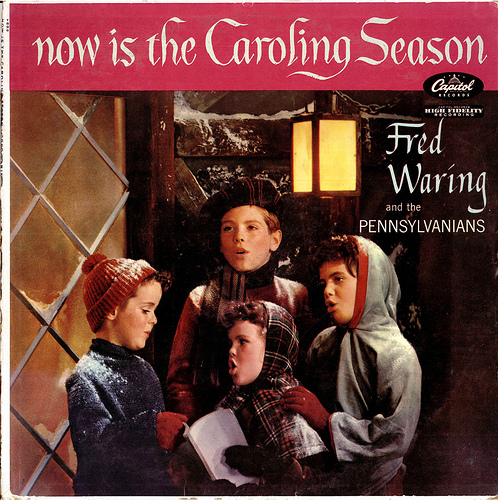 These carols are probably a bit more familiar to your ears than those of The Cambridge Singers, but still remain fairly traditional, similar to the selections of the Robert Shaw Chorale, which is an old standby, along with Now Is the Caroling Season by Fred Waring and the Pennsylvanians, a favorite from my childhood.